Applied Research Associates, Inc. (ARA) and its Virtual Heroes Division (VHD) in the United States support a broad spectrum of clients in the Federal System vertical market, among them Nuclear Security Clients. In 2012, the International Atomic Energy Agency (IAEA) applied safeguards for 179 States with safeguards agreements in force, implementing safeguards at 692 facilities. To support the IAEA mission, the Safeguards Training Section of the IAEA Department of Safeguards holds over 100 training courses yearly to help safeguards inspectors and analysts develop the necessary knowledge and skills. Serious Games provide the opportunity to train under different scenarios not possible in real facilities. 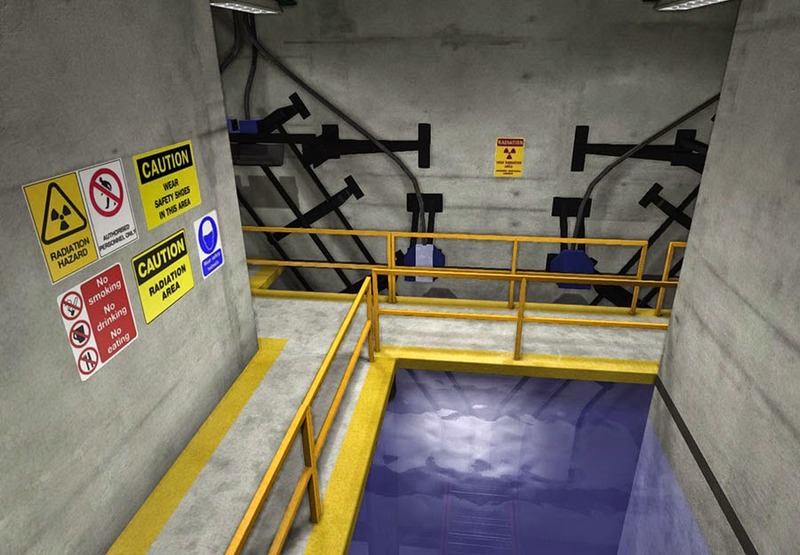 In order to take full advantage of Serious Games, the Safeguards Training Section has collaborated with IAEA Member States to develop and evaluate virtual facilities and interactive training tools. 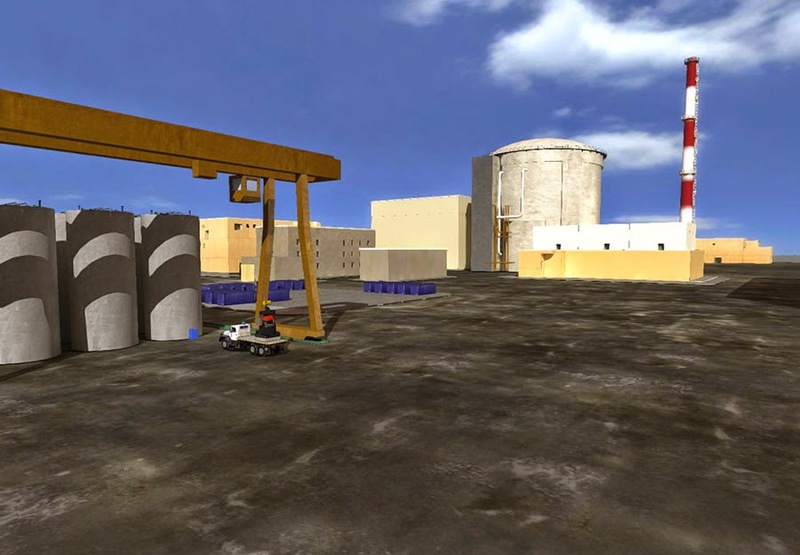 ARA’s Virtual Models of Nuclear Facilities are a great example of Serious Games for Nuclear Security and Safeguards, comprehending two virtual nuclear facility environments — a Pressurized Heavy Water Reactor (PHWR) facility and a Gas Centrifuge Enrichment Plant (GCEP) facility. 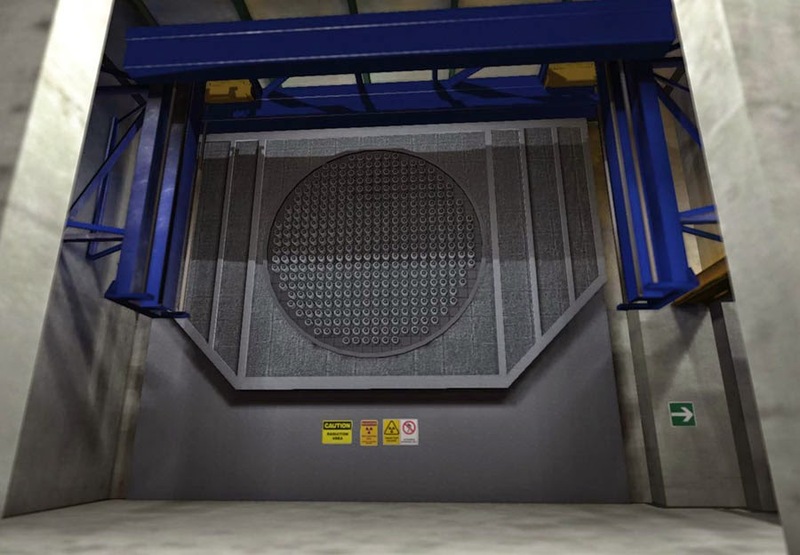 Both virtual facilities provide a unique approach for training inspectors in a cost-effective manner. 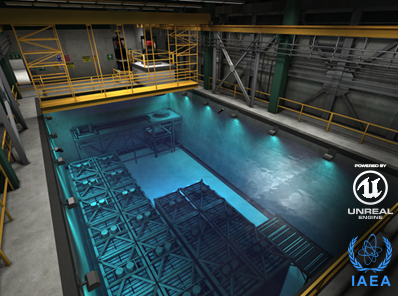 The PHWR model was built through a contract supported by the US Safeguards Support Program (USSP) to create a “virtual” nuclear power facility. This application is being used by IAEA as a facility familiarization training tool for new safeguards inspectors. The GCEP facility simulation was built for the Defense Threat Reduction Agency (DTRA) to aid in training inspectors supporting treaty verification activities and certain military operations. 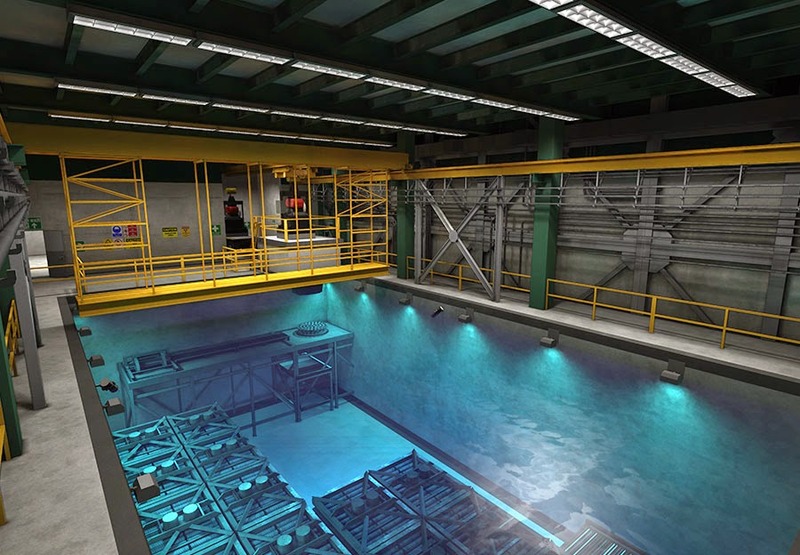 In combination with a visually impressive 3D rendering of a GCEP, the model also incorporates state-of-the-art physics calculations to aid users in identifying the radiation hazards in the uranium-enrichment facility. 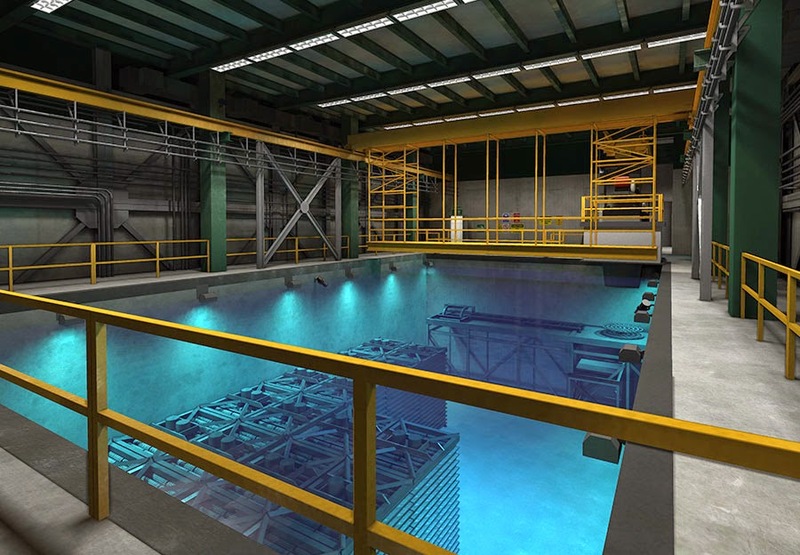 The Pressurized Heavy Water Reactor (PHWR) is a virtual-environment simulation of a nuclear power plant. PHWR is used to train IAEA safety inspectors, helping trainees understand the flow, processes and handling of nuclear material inside the facility; visualize the basic operations/layout of the facility; and identify principle safeguards measures applied throughout the facility. Trainees navigate seven distinct areas in the PHWR facility. Via an automated fly-through or a self-guided walk, users follow the path of fuel—from its arrival, to its placement in the reactor, to its deposit into long-term dry storage. All seven areas feature highlighted points of interest. When selected, these provide specific information about the area and the various operational and safeguards equipment. The development team (IAEA, ARA, and USSP) consisted of experts in the fields of nuclear engineering, 3D modeling, video game programming, and cognitive task analyses. IAEA provided input on a number of levels drawing significantly on senior staff with cumulatively over 1000 inspection days at PHWRs. Applied Research Associates, Inc. (ARA) is an international research and engineering company that was founded in Albuquerque, NM, in 1979. ARA has over 1200 employees with sixty-two offices throughout the United States and one in Canada. The company provides a broad range of technical expertise in defense and aerospace technologies, civil technologies, computer software and simulation, systems analysis, environmental technologies, and testing and measurement. ARA also provides sophisticated technical products for environmental site characterization, pavement analysis and specialized robotic vehicles. As a complement to its existing computer software and simulation capabilities, ARA acquired Virtual Heroes Inc. in 2009. Virtual Heroes creates collaborative interactive learning solutions for the healthcare, federal systems and corporate training markets and specializes in creating immersive 3D serious games with realistic 3D simulations and models to accelerate learning, increase user proficiency and reduce training costs. Virtual Heroes has quickly become one of ARA's key divisions and has been an important element in establishing ARA as an industry recognized leader in immersive, high-fidelity simulations for learning, serious games and virtual worlds training and education. ARA's Virtual Heroes Division has an outstanding record of success with previously released games, training, educational content, and virtual worlds including; Zero Hour-America's Medic, 3DiTeams, Pivotal Decision, Adaptive Thinking and Leadership, America's Army, Pamoja Mtaani, Virtual Peace and Ultimate Team Play.